We’re exploring ways of bringing our body’s energy systems back into balance. I want to share an Energy management 101 concept that’s probably made more of a difference in my life than just about anything else. This idea of the daily ‘energy balance sheet’ grew from a seed planted by Caroline Myss PhD in her Energy Anatomy teachings. This is not about number crunching to keep your accountant happy, this is looking at how much energy is going out each day, versus the amount brought back in. Side note: I cannot recommend Caroline’s teachings highly enough to gain a deep understanding of our own energy system. 10% is sent off to the future to figure out how to pay for all the gifts required for the upcoming gift-giving season—and there’s always one right? If it’s not Easter, it’s Christmas! 20% is available to power ourselves for the day. Twenty percent. This is how much you’re leaving yourself to power your brain, heart, muscles, kidneys, liver etc. Can you see how easily we give our energy away to things/people/events that don’t actually serve us in the moment? We operate in energy deficit a lot of the time because we’re either looking back or looking forward. Our energy literally goes where we focus our attention, so is it any wonder we tie ourselves up in energetic knots. Instead of letting your energy slowly drain out like a dripping tap, think about turning off the taps by examining where you’re spending your energy each day. You may want to take a week to monitor your daily energy expenditure by writing it down in your diary or journal each evening. The same way you might keep track of your financial expenses. At this point don’t judge it, just observe what’s happening, and perhaps look at the patterns that are emerging. Are you anxious about the state of whatever-the-heck was in the news today, rather than the parts of your life that are in your realm of control? Are there certain people you find it harder to say ‘no’ to than others? Are you investing more time in helping others achieve their goals than dedicating adequate time to your own? Do you find yourself re-telling the same tales of woe to anyone who’ll listen? Are you worrying more about what everyone else is doing, instead of focusing on your own backyard? Are you finding yourself ruminating about past events, or beating yourself up about decisions you’ve made that you can’t change? One of the ways we can work on the entrenched patterns around our energy expenditure, is to set ourselves a goal to address them one at a time. The first thing to do is be kind and patient with yourself like you would be with a child if you were teaching them a new skill. Pick one of your current energy expenditure habits. Now close your eyes and imagine getting to the end of your day without indulging in this habit. Does your body feel different? By placing our attention on an area of our life where we wish to make changes, we automatically plant the seed for success. The thing to keep in mind with any new habit we’re cultivating, is to keep the goal in focus. 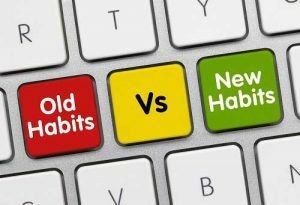 Apparently it takes our brain 21 days to fully entrench a new habit within our subconscious mind. So keep at it. Return often to the image in your mind’s eye, of a day without indulging in that old energy expenditure habit. If you need to, put it on a piece of paper and stick it in the fridge/pantry/bathroom cabinet. To keep your energy in top shape, revisit your daily energy balance sheet often. Where can you make little changes to help divert your energy to yourSELF rather than sending it out to things that don’t serve you?